Tanzania has lost a “catastrophic” 60 per cent of its elephants in just five years. The numbers have plummeted from an estimated 109,051 in 2009 to 43,330 in 2014, says the latest report released by international wildlife conservation non- profit TRAFFIC. More shocking numbers by the non-profit reveal that since 2009, at least 45 tonnes of ivory has flowed from Tanzania to international markets in Asia. While announcing these numbers, Tanzanian Minister for Natural Resources and Tourism Lazaro Nyalandu on Monday also announced a slew of measures to protect the country’s elephants. 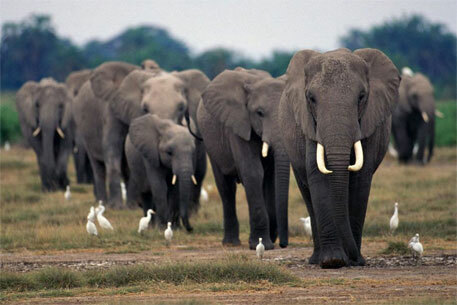 A few days earlier, Tanzania’s neighbour Mozambique, in collaboration with US-based Wildlife Conservation Society, had revealed that the elephant numbers in the country have declined from 20,000 to 10,300 due to illegal wildlife trade. This means the country lost nearly 50 per cent of its elephant population in this period. A recent study published in journal PNAS had warned that illegal killing for ivory was driving global decline in African elephants. An estimated 100,000 elephants (Loxodonta Africana) were killed by poachers across Africa between 2010 and 2012, said the study that was led by George Wittemyer, professor in the Department of Fish, Wildlife and Conservation Biology at Colorado State University's Warner College of Natural Resources. The study used data that was compiled under a programme by conservation non-profit Convention on International Trade in Endangered Species (CITES). "The study confirms that elephant populations in eastern and southern Africa were in good shape until 2008, but then started to decline. Now, about 75 per cent of the populations across the continent are shrinking," it further added. Meanwhile, British broadcaster and naturalist David Attenborough has warned that rhinos and elephants will become extinct in Africa in the next decade if consolidated charity and conservation efforts are not undertaken. “I’m not going to say we don’t care about protecting rhinos or elephants or African megafauna. If you said ‘yes, they’re all going to die within the next 10 years’ you would stop trying to protect them and they would die within the next 10 years,” he added.